Discover some of the most important historical places of Madrid! What a better way to start your visit in Madrid than walking through beautifull streets of this city while you get to know other travellers. 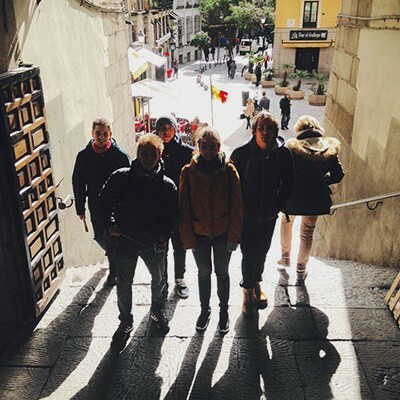 In this tour our charismatic guides we’ll take through some places in Madrid that probably are on your list of places to visit, but they we’ll also give you a piece of vibe of the city, they we’ll try to show the Madrid we love and that probably after you get it to know it, you will love ot too! Habsburg, Bourbons, Napoleon…streets of Madrid are full of history. 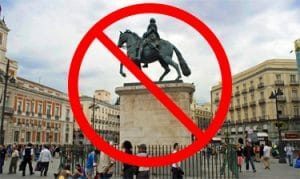 On the free walking tour Madrid Highlights we will walk through some of the most emblematic streets, and during 2 hours will tell you all the history, anecdotes, and legends of every of that places. This tour is for FREE! 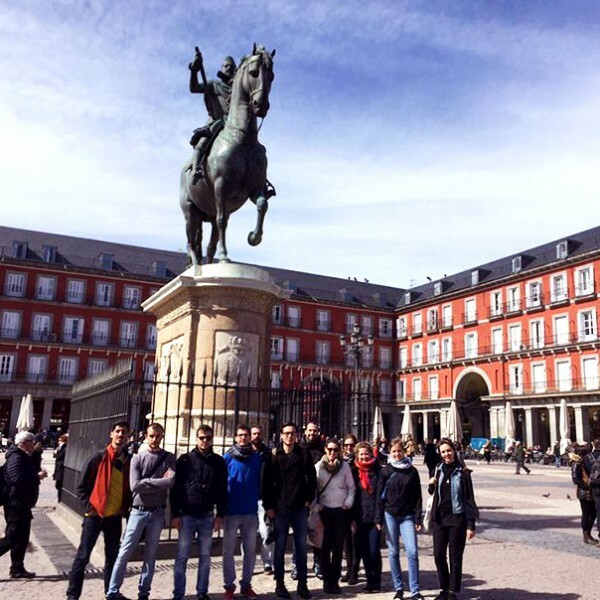 The free walking tour Madrid Highlights starts everyday at 5:00 PM. We will wait for you by the BEAR statue in Puerta del Sol (metro line 1, 2 and 3). 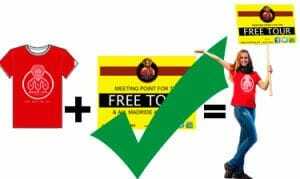 Just look for our guides with the BEAR logo in the red t-shirt and the big yellow sign (check the map below) REMEMBER! 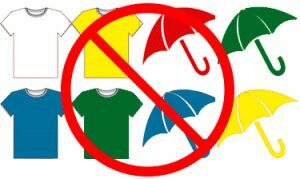 We don’t use umbrellas! On the free walking tour Madrid highlights you will walk with us trough the small and hidden streets of the Spanish capital. Madrid has a lot of history, from Moorish empire…dynasties…. to the rule of Napoleon and the war for independence. All of them left some kind of influence on the city and its architecture. Discover Madrid from the different epochs with us. We will tell you all about the most important historical sites of Madrid and about its kings and royals. If you are one of those people fascinated by history and legends and always want to learn more, and you would like to hear more about the Spanish capital, we can recommend you to join our Free Walking tour Madrid Essentials every day at 11:00 hrs. And well after you have done both walking tours (Essential and Highlights) the only thing you have to do it’s seat in a terrace and enjoy the Madrid’s life…… maybe with a good glas of sangria or tinto de verano! THE BEST WAY TO GET TO KNOW A CITY IT'S BY WALK! If you already have done our Free Walking Tour Madrid Essential, this is the perfect complement. You’ll get to see the rest of the landmarks in the city. 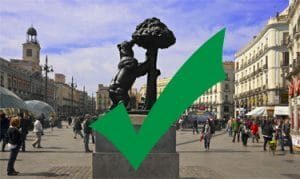 On our free walking tour Madrid Highlights you will get a lot of recommendations about what to do in Madrid! This tour is tip based, which means that depending on how much you have enjoyed the tour feel free to leave or not a tip to our guides. Don’t worry if your traveling on a low budget and your economy is a little bit tight, we will be more than happy with a loud applause and your good reviews! However, the most important is to have a good time! 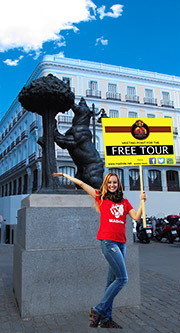 Free walking tour Madrid Highlights is provided only in english. Complete your stay in the capital with another free tour. YES, we have 2! Take a look to our FREE TOUR MADRID ESSENTIAL in main menu. YES, this is the BEAR statue!